A federal appeals court in Boston upholds the dismissal of a $14.5 million defamation verdict against Paul Kendrick. A federal appeals court in Boston ruled Thursday in favor of a Freeport man who had been sued and found guilty of defamation because of statements he made about the founder of an orphanage in Haiti. Paul Kendrick was accused of defamation after he began a widely disseminated email campaign in January 2011 accusing Michael Geilenfeld, the American founder of an orphanage in Haiti, of sexually abusing the boys in his care. Kendrick later widened the campaign to include Hearts with Haiti, the North Carolina charity that raised donations to fund the orphanage. The lawsuit led to a complex, long-running case and ultimately to Thursday’s ruling, which happened to be written by David Souter, a retired U.S. Supreme Court justice who sometimes takes on circuit court cases. In the ruling, the First Circuit Court of Appeals upheld a June 2016 decision by a federal judge in Portland who dismissed the defamation case and a $14.5 million verdict against Kendrick. Kendrick had been found guilty of defamation after a U.S. District Court trial in Portland in the summer of 2015. But, the federal appeals court raised questions in the case and, last summer, District Court Judge John Woodcock Jr. ruled that Geilenfeld wasn’t living in the United States when he filed his claim against Kendrick and therefore the case had no grounds to be heard in a U.S. court. Geilenfeld appealed that decision and, on Thursday, lost the appeal. The new appeals court ruling sides with Kendrick and says that Geilenfeld was nominally a resident of Iowa, but hadn’t voted there since 1972 and had no property there and was really a resident of Haiti. It’s unclear whether Geilenfeld will appeal the newest ruling. In the initial trial verdict in July 2015, the Portland jury indicated it did not believe seven former orphanage residents in Haiti who testified about sexual abuse, and instead found that Kendrick was reckless and negligent in making the accusations. 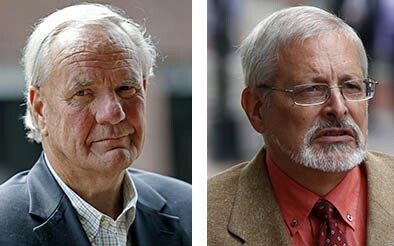 It awarded actual damages of $7.5 million to Hearts with Haiti, and $7 million to Geilenfeld. During the appeal, Kendrick’s attorney raised questions about whether Geilenfeld lived abroad, triggering an arcane legal exception that rendered him unable to file a lawsuit in U.S. federal court.